DescriptionFresh aromatic rosemary & sage essential oil purify skin and stimulate circulation. 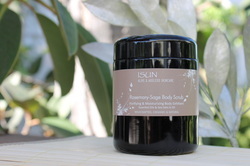 Infused into soothing, high, oleic, sun flower oil, the skin is nourished and moisturized as dead surface cells are exfoliated with fine mineral sea salts. - Mix salts with oil in jar. Use about 1 tsp at a time of blended oil & salt and scrub on dry or damp skin. Add a little water and scrub more. Continue adding water until salt is dissolved. Rinse and pat dry.